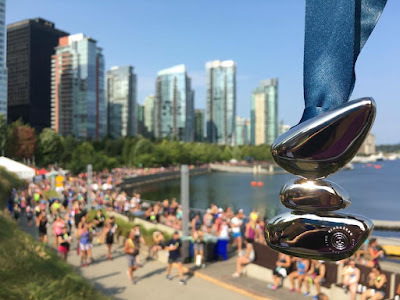 Finally, here is my recap of half marathon #10 + my 4th SeaWheeze that I ran last weekend in Vancouver. 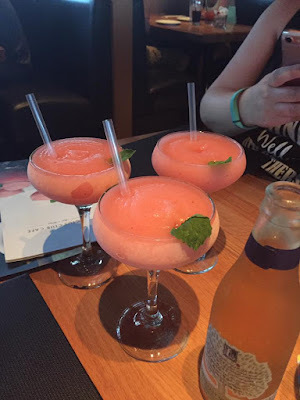 I had uploaded some photos onto the blog without writing anything so I was able to salvage these photos of our trip which makes me somewhat happy. 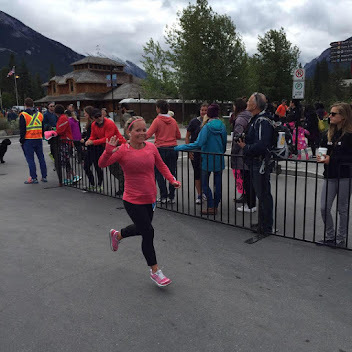 I didn't have a great race so it was really difficult trying to find the motivation to write this post but here goes. This year Alex and I decided to fly to Vancouver instead of drive. Best decision ever. Not sure why we didn't do this before haha. Our flight left Calgary at 7am and we arrived in Vancouver at 723am. We took the Canada Line from the airport to the waterfront station and from the map we thought it was all Zone 1 but when we got to the waterfront station, it asked for another $1.25 to be added to our compass card. Alex was able to sneak through the gate with someone but I wasn't as lucky. I went to add the extra money to my card and it wouldn't let me because it was a one time use card so I had to pay almost $6 to get out of the tunnel. I was so annoyed. We then had to push/pull our suitcases to our hotel which is a 20 minute walk up hill in hot weather. Not the best but we made it finally haha. We were lucky enough that our hotel had our room ready and could check in early. We ditched our stuff and changed into cooler clothes and went to IGA to get some gatorade, fruit and some other fun snacks. After we got back to our room, we decided to head down to the waterfront and walk around and wait for Michelle and Dahlia to get in as they came on a later flight. We chose the real early one because it was the cheapest haha. We met Dahlia + Michelle at the Rogue at the Canada Line building near the waterfront. It would be our only stop there this trip which is very unusual for us. 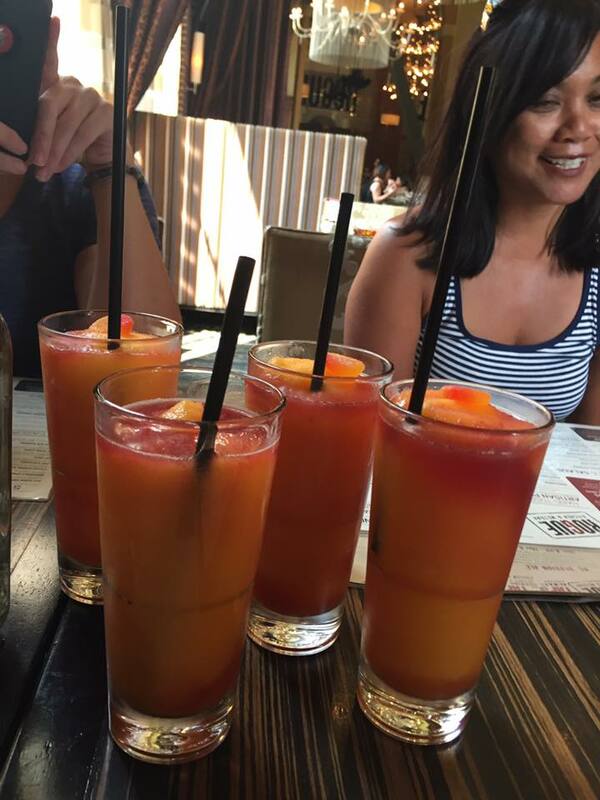 These bellini's were delicious and I may have had 2 of them. After lunch, we headed back to our hotel so they could drop their bags off and then we went back to the iga so they could get some snacks and stuff too. We had a rest in the hotel before heading back to the convention centre so Dahlia and I could do the YYCwheezers shake out run. As we were walking down to the VCC, we saw a crowd of people at a back alley and we assumed that they were filming DeadPool 2 and that we were going to see Ryan Reynolds. That did not happen. 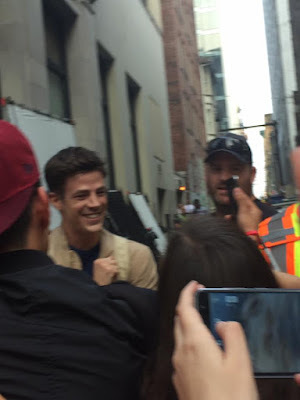 This was filming for The Flash which I have never seen but apparently this guy is the star and he is quite the popular human. People were going nuts and I couldn't breathe or move. He was cute but he's no Ryan Reynolds. Eventually we made to the meet up area and I was able to pick up my YYCWheezers shirt. Our run club, YYCwheezers got a deal from Lululemon to buy these shirts and then we had a local lady put on our club name and the mountain logo. It says something on the back too but I honestly have no idea what it says haha. If you are looking for a run group here in Calgary that is amazing and supportive and very active then search for us on Facebook. 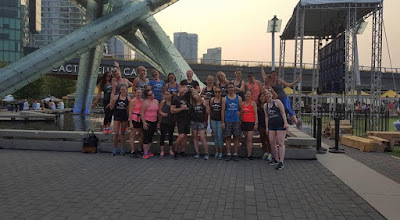 It is a great running community. And here are a bunch of us before our shakeout run!! Love these girls!! This was taken around 745 or so just at the start of our shakeout run. It was so freaking hot and so smoky but it looked worse then what it felt like. 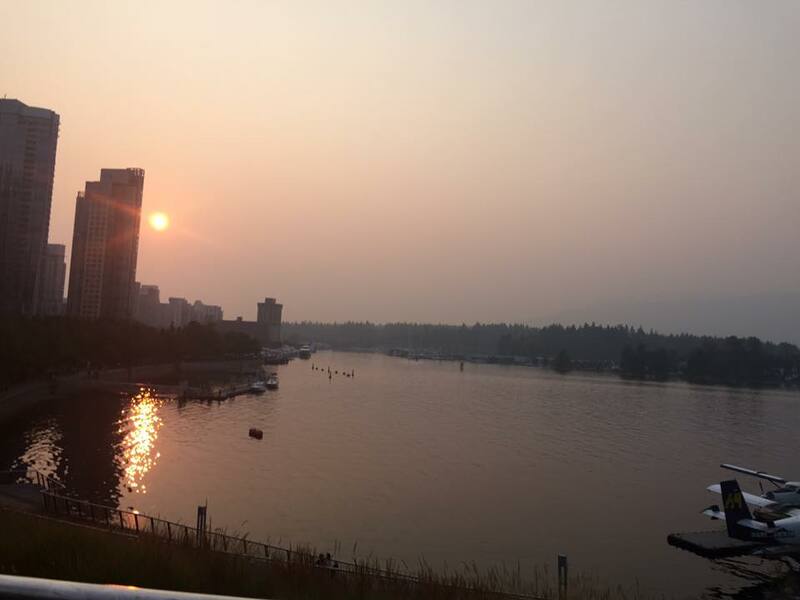 You could smell the smoke more in Calgary the day before. In fact, I didn't notice any smoke smell at all, it was definitely smoky and hazy and hot which made for a bit of a tough run but I ran so well that I was really confident going into Saturday's run. While Dahlia + I were running, Michelle + Alex waited for a table at the Cactus Club since it was literally right there. It was ready just after we finished. We tried their new summer drink but I can't remember what it was called. It was cold so I enjoyed that since I was so hot after my run but I can't say i really loved it. Our food wasn't that great either but it was fun night regardless. After dinner, we walked by the line up for the showcase store that was to open the following morning at 7am. People had been lined up since Wednesday morning so I expected it to be insane but it wasn't too bad. I joked that we should just stay and Michelle didn't say no so that's how we ended up staying over night. 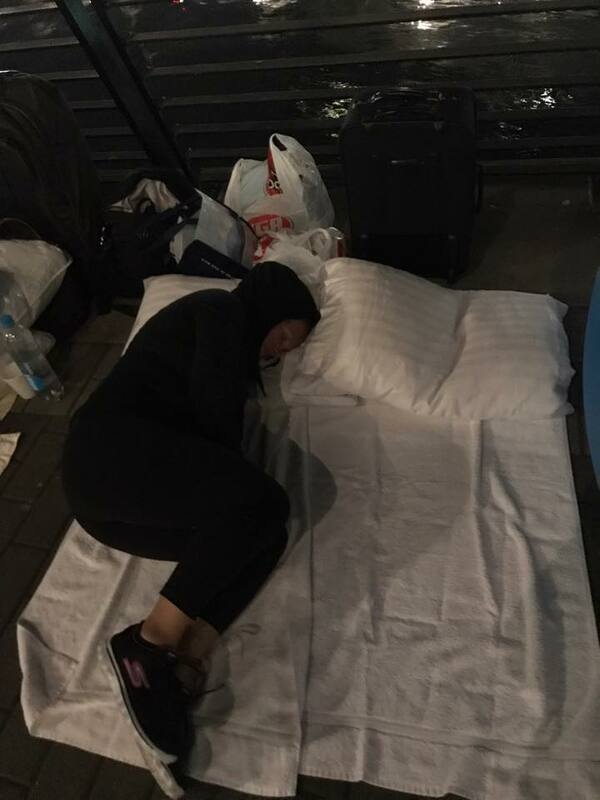 I held our spot after supper while Michelle went back to our hotel to get towels to sleep on and sneak pillows out using Dahlia's suitcase. We had a bag of food that we didn't touch because Lululemon delivered pizza to all the liner uppers around 12-1230. I only got about 2 hours of sleep which could have been why I was so sick on Saturday but it wasn't because the ground was uncomfortable but mostly because I was cold. We met a lot of great people and it was a really cool experience. I don't know if I will do it again but it was fun. We weren't part of the initial first wave that got in but we were in the store at 7:06 - so right after opening. 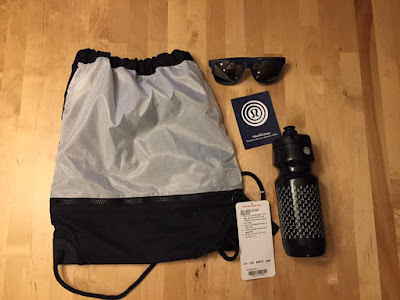 Instead of having everything sorted by size, they had all the shorts right when you went in, and then bags and accessories and all the reflective gear in the middle. Then around all of the middle stuff, they sorted everything by colour story and then by size within each story. I didn't mind the sorting by colour story as opposed to size but they could have had the size numbers a bit more obvious when trying to look within each. It was hard to see what size I was looking for. The reflective gear was a hot hot seller and I stayed away from there. It was wayyyy more then regular items and I didn't even know what it looked like since I didn't see it on the sneak peek preview of the store. They had another line up to get it and you were only allowed 3 items to purchase. However, I saw someone wearing the reflective shorts on Saturday and they are so pretty but as much as I like them I could never justify the price of them anyways. Here is my haul: the top are speed shorts. 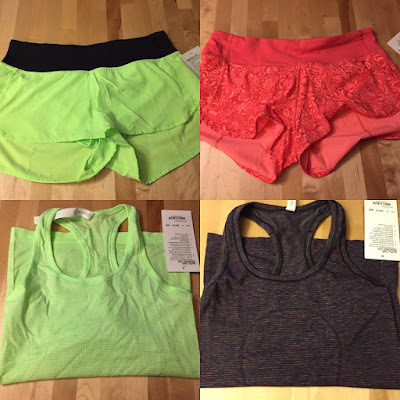 I bought the lime green shorts for myself. Alex + Dahlia also got those lime green shorts too. Dahlia bought the ones on the right and I decided not to buy them but then we got back to hotel and she paired the shorts with her navy tank, I loved it. Then I saw another girl wearing them with a white tank and I really needed to have them. 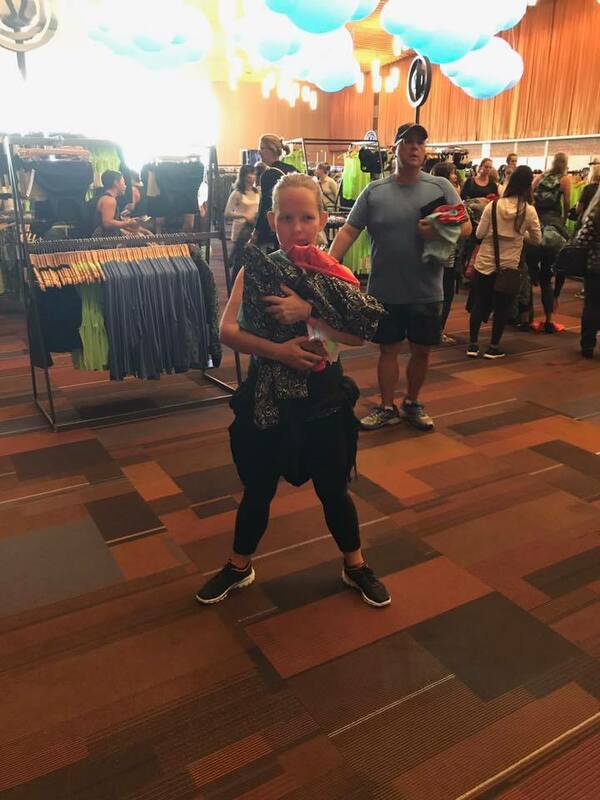 We went back to the showcase store but they had none left but I managed to find someone on the SeaWheeze Chat group for face value so I picked them up and I was happy. They had no crb's this year which as a avid crb lover disappointed me but I found 2 swiftly's that I really liked. The one on the left is the same shade as my shorts and the one on the left is super cute with some great colours in it. Dahlia also got that one too. I also bought 2 scrunchies for the girls that they are loving big time. When we went back to the showcase store later in the day, I ran into my friend Christy from high school who was running her first sea wheeze and half marathon so that was really cool too. I also then bought Greg a running/biking/hiking shirt in the same colour as my swiftly and shorts. I wanted to buy him shorts but I had a better idea on shirt size then short size. Alex and Dahlia also picked up a few items too. After our first visit to the showcase store, we met up with Alex + Dahlia outside who kindly brought us some much needed starbucks and then we went to grab our race packages. The sunglasses didn't come from package pickup, they actually handed them out at the end of the race but it worked well in the photo haha. And now comes the dreaded part of my weekend in Vancouver: the race. I woke up not well and knew it wouldn't be great but I had no idea it would be as bad as it was. I pushed throughout the discomfort for as long as I could but it just got to be too much. I went to a bathroom on Cornwall Street in Jugo Juice or something like that and hoped that was all I would need to do. And when I left I felt much better and was hopeful but it didn't last long. I endured 3 more bathroom visits, several tears shed during each one and watched as the pace beavers that were far behind me were now moving far ahead of me. 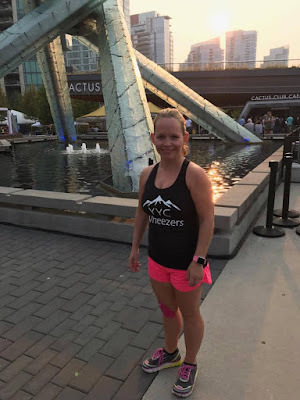 I couldn't run for long periods because I just felt so much pressure within my body and walking was just less uncomfortable so I ran as fast as I could when I could run and then walked when I had to. If you take away the time spent in bathrooms, I actually did well so that made me feel a little better after I finished. I texted my best friend Kristen back home and told her my horrible story as I waited to get brunch and she gave me the pep talk that I needed and then I was ok. Mentally that is - physically I used the bathroom a few more times before Alex finished and then we had to stop once on our way back to our hotel so I could use it. By this time, I had come to terms with my bad race and wasn't going to let it ruin the rest of our time in Vancouver. Once I showered, used the bathroom again and had a bit of a nap, I was starting to feel ok. Michelle's feet were in rough shape and she was napping so the rest of us walked to the closest mcdonald's and celebrated finishing our half marathon with chicken nuggets and french fries and hamburgers. It was perfect. After our late lunch, we went back for another rest before we headed to the Sunset Festival. I was feeling a bit better and was looking forward to the festivities. 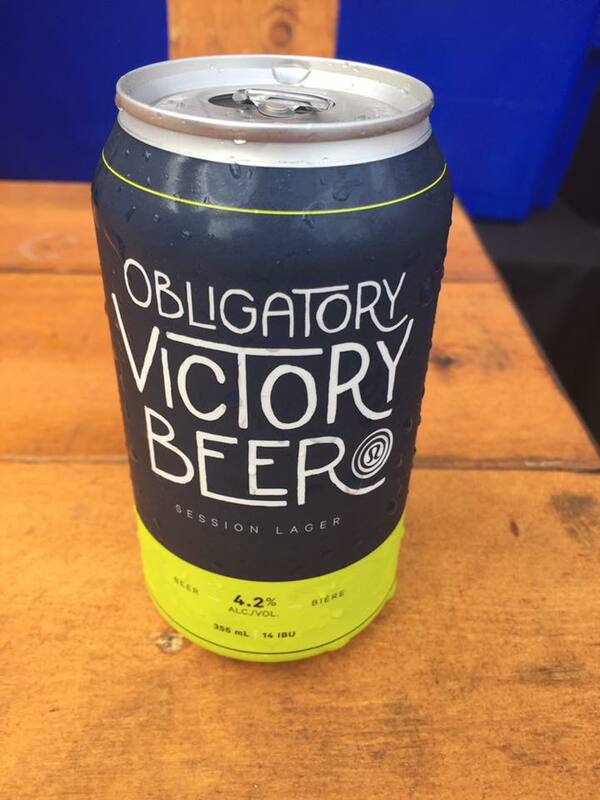 Alex bought the seawheeze beer but the can looked prettier then it tasted haha. We didn't participate in the yoga-ing but it looked cool watching everyone else do it haha. They moved the location of the festival this year and it was so much better. It was still in Stanley Park but the space was far larger making more room for lots of food stands and their vendors in the market place. I was much more pleased with it this year then in previous years. The next morning Alex and I walked down to gastown to continue our Sunday brunch at The Flying Pig. We accidentally walked into a commercial shoot but they were pretty nice about it and just asked us to cross the street which we did and then watched while they worked on it. Our brunch was really good but the service not so much. After lunch we headed back to the waterfront for something to do. As we got to Canada Place, all these sirens started going off and roads were being blocked off. 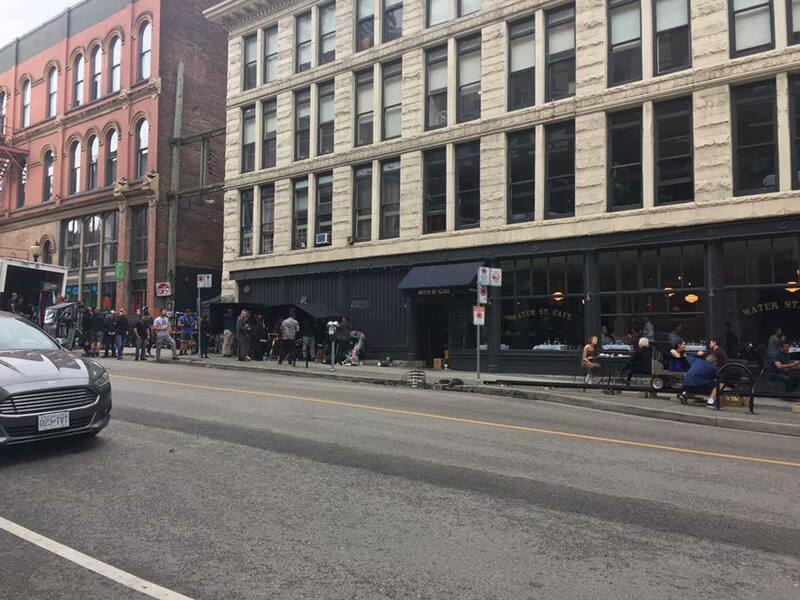 We had just assumed it was part of The Flash being filmed or something like that but we were so wrong. There was an accident involving a charter tour bus and 3 pedestrians loading their belongings into a vehicle. I don't know how it happened, but someone lost their life and the others were rushed to a hospital to get looked at. I did see a few days ago that the man who died was there on vacation from Massachusetts where he was a doctor. It was not the best thing to run into on vacation and even harder to see the witnesses recall what they saw in front of various cameras. Dahlia met up with us and we walked through Canada Place and down The Canadian Trail and looked at the 2 cruise ships that were currently docked there. All in all, we saw 5 different ships docked which made Alex very excited haha. 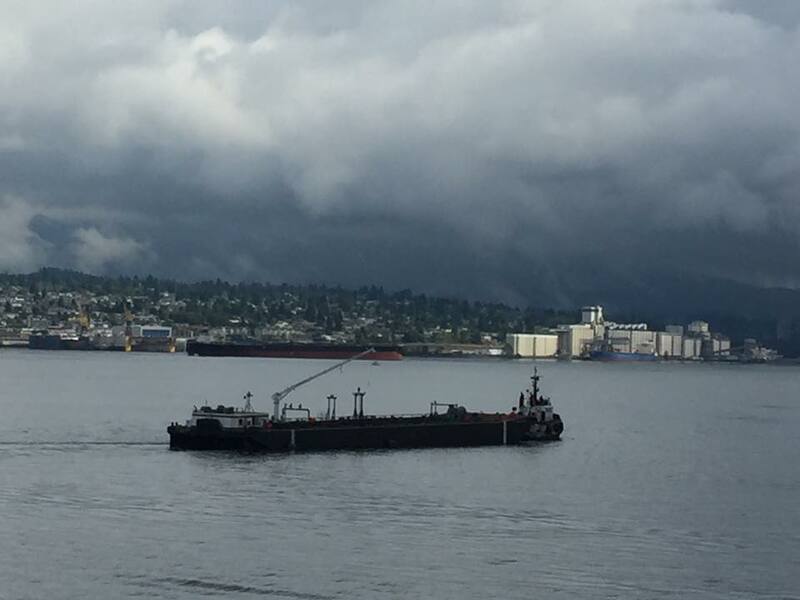 I got to see a tug boat pulling the big boat above which is one of the coolest things to see. How can something so small tug something so huge?? We also saw where they store all of their container boxes and stuff that come in via boat from other countries. I always knew that there would be a lot of them but was surprised to see as many as I did. After this, we met Michelle at the Earl's test kitchen near our hotel and although I was feeling better earlier that day, I definitely wasn't feeling well at lunch. 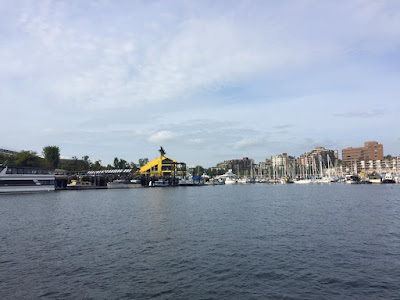 We all went back to the hotel and had just chilled before Michelle went for her massage and Dahlia met one of her friends and Alex and I ventured over to Granville Island. Alex and I took the Aquabus over to the island. 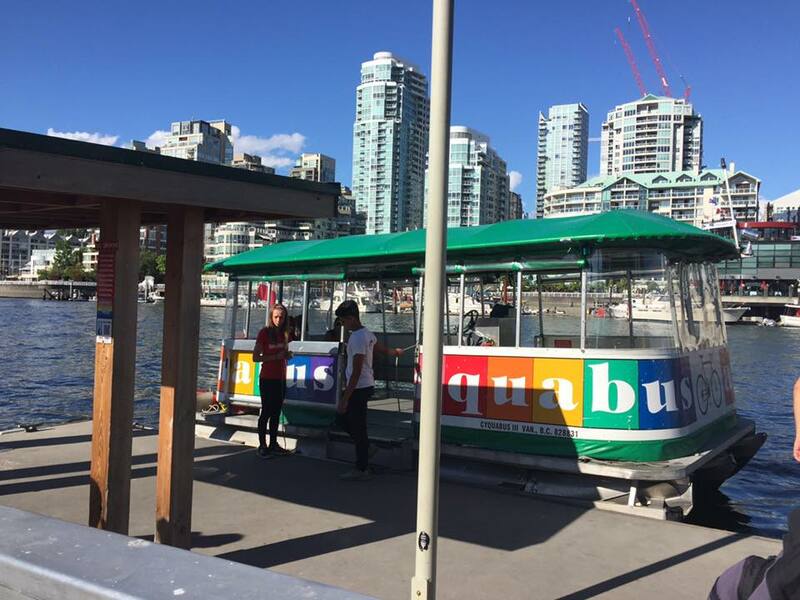 It costs $6 round trip and it is super quick to get from the Hornby Street Station to the Grandville Island station. And it is super cool too! We got to the Island super late in the day and most of the shops were closing so we kinda just walked around and ventured into parts of Granville Island that neither of us have had seen previously. 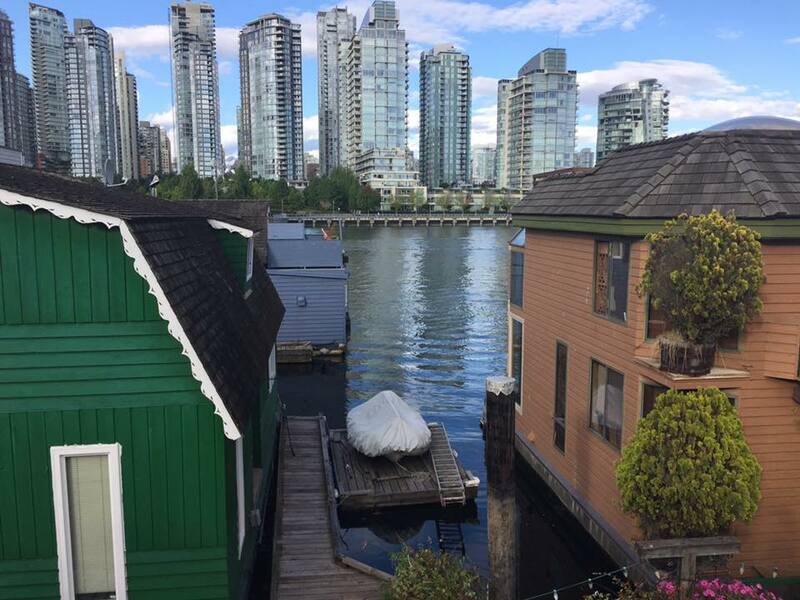 We came across these amazing house boats and the views they have are spectacular. Some of them are a little run down but with views like that it doesn't matter too much haha. 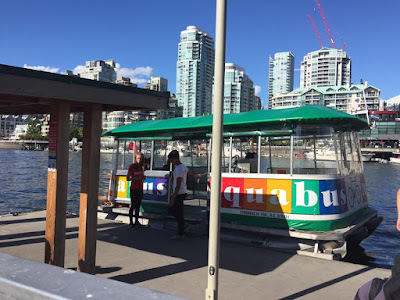 After this, we took the aqua bus back to the other side and walked to the cactus club in yaletown where we had the best server and a really great meal too. It was a nice way to end the day. On Monday morning, Dahlia + Michelle flew back to Calgary but we didn't leave until later in the day so we got some Starbucks and went for a walk around the waterfront. As we were walking along the street towards a movie set that we saw, sirens started blaring and we had no idea what was going on. The first security guard told us that legally he had to say that it was caribbean blue filming right now. So I googled caribbean blue movie cover up in vancouver and quickly found out that it was indeed Deadpool 2. At this time, we still had no idea what was going with the sirens and police cars or anything like that. But within seconds, we knew it was a motorcycle crash and it wasn't good and it may or may not have been a stunt gone wrong on the movie set. They had umbrellas covering the person involved so that it was blocked from media and people walking by. But they came down once the person was put into the ambulance and when the ambulance didn't leave, you knew it was a terrible situation. We walked around the back of the area to find bathrooms and a garbage can near the cactus club where we stopped to talk to someone who saw the accident go down. He said the stunt woman had performed the same stunt a few times with out problem and he walked out of the starbucks that was right beside it and they director yelled action and the motorbike took off too fast down the ramp and lost control. He said it was the worst thing he has ever seen and I am eternally grateful that we were 5 minutes behind the whole thing. 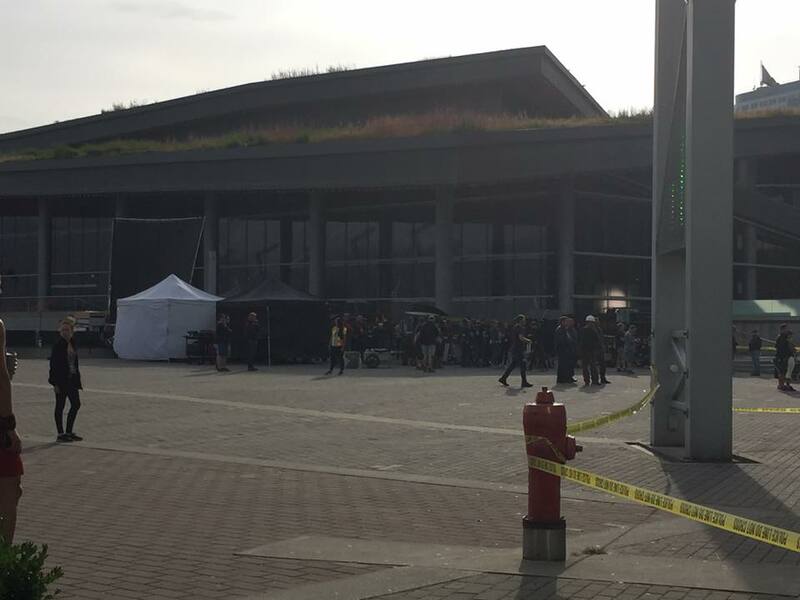 As cool as it was to finally come across Deadpool 2 filming, the situation surrounding it sure put a damper on all of it. 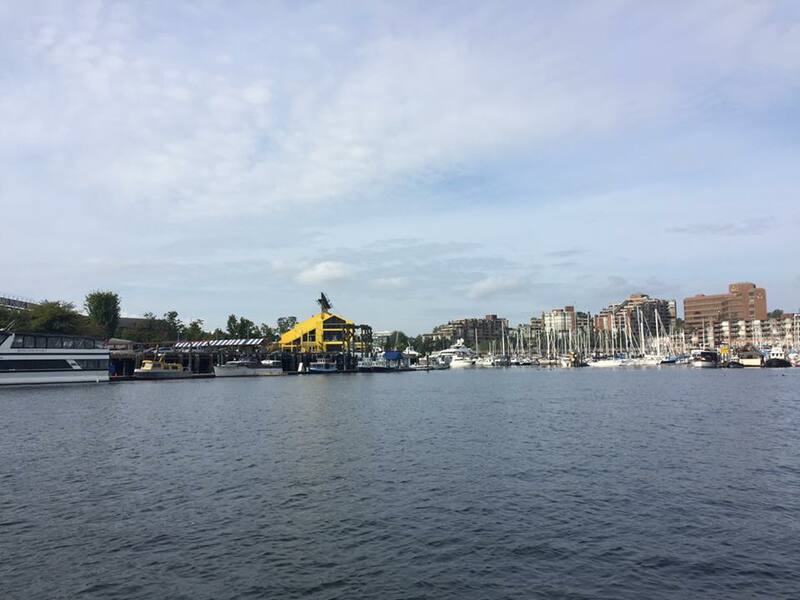 We wanted to put the sadness of the morning events behind us so we decided to go back to Granville Island since we couldn't do much shopping the day before since we got there too late. We both bought some stuff at Make which is a super cool store where they custom make shirts and pillows and so much more plus they sell all kinds of local brands too. Check it out if you are ever down there. We came back to the other side, walked down Robson one last time before heading back to our hotel to check out. They had given us a late check out time which was really good given our late flight. We grabbed our luggage and pulled them down to the train station to get to the airport. It was much easier this time since we were heading down hill. We hit the right zone and didn't have to pay any additional money once we got there and that was a relief. We checked our bags for our flight and then we had lunch and waited for our plane to leave. 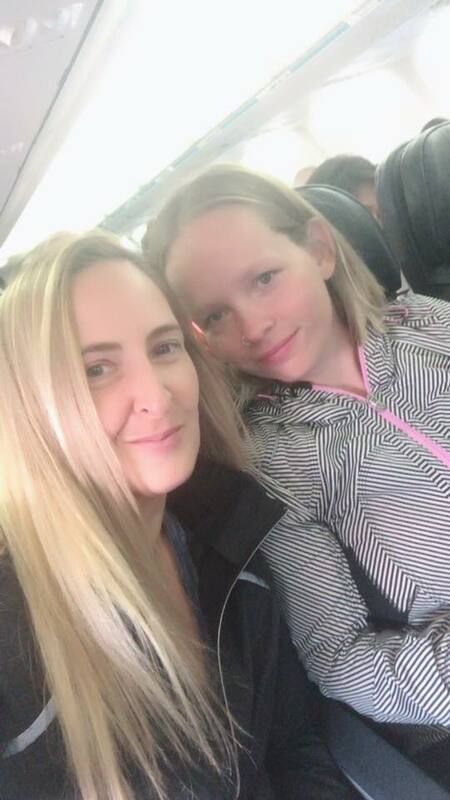 It was raining when we arrived back in calgary but it was nice to be home. The girls and Pizza were so excited to see me and they loved their new scrunchies and Greg loved his new shirt too. Although race was nothing like I thought my 10th marathon would be, I am still proud that I pushed through it all and finished it. I posted my unhappiness with my race on social media and was overwhelmed with the messages that I got from everyone and made it more easy to swallow that is for sure. It is just tough to train so hard for a race and be so confident going into it and then have something so out of my control happen to me. I had one horrible race prior to this one that I have used a source of motivation to push through other difficult runs and races and I plan to use this one to do the same. Hopefully I can bounce back before my next half marathon in September! Also, I was only $57 over budget this year which is my best seawheeze to date haha although that didn't include flights. Greg was super proud of me haha. Also major props to Lululemon and their SeaWheeze team for putting on another spectacular weekend. 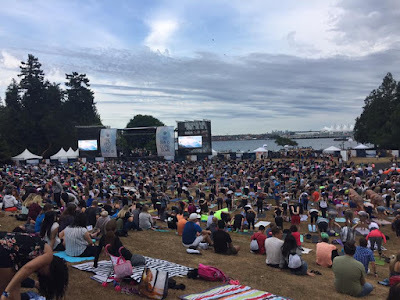 I can't wait for Seawheeze #5!! !